The United States has excluded three Caribbean countries from the visa waiver scheme because of their good relationship with the Venezuelan government. The government of Antigua and Barbuda has said that its exclusion from the United States’ visa renewal waiver is due to its support for the Bolivarian government in Venezuela. The Cabinet of Antigua and Barbuda held a meeting to discuss the U.S. decision to penalize the two-island nation along with Dominica and St. Vincent for their friendly relations with Venezuela, and exclude them from a waiver program that would allow citizens to renew their visitor visas without going through the complicated full-interview process. 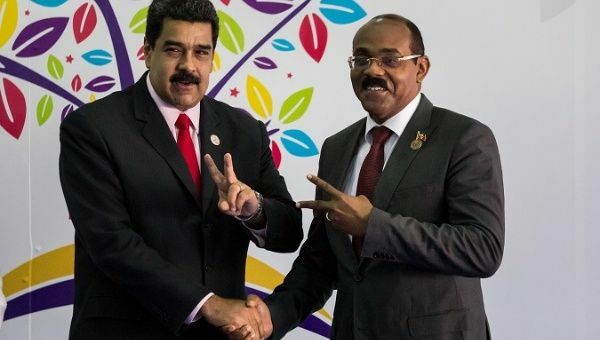 “The Cabinet is firmly persuaded that the exclusion is connected to the friendship which the three states have developed with the Bolivarian Republic of Venezuela,” the Antigua and Barbuda government said in a statement. The three countries, which make up half the Organization of Eastern Caribbean States (OECS), rejected the Organization of American States (OAS) resolution against Venezuela, which damaged relations with the United States. “The decision by these three states to adhere to the principle of non-intervention in the internal affairs of member states has been identified as the principal reason,” continues the Cabinet statement. The government of Antigua said it enjoys good relations with both Venezuela and the United States, and regrets that Washington is violating international law and using the visa renewal waiver as a means to press it into acting against its own interests. On a radio show broadcast during the weekend by Pointe FM, Prime Minister Gaston Browne asked what the reason behind such a decision could be. Anthony Astaphan, a Dominica attorney who appeared on the same show, had a more direct answer and asked why the United States was also rewarding countries Washington had previously punished, such as Saint Lucia. “I think it is punitive, maybe with a small p, but it is punitive because they did not follow the call of the United States,” said Astaphan. Saint Lucia, also a member of the OECS, did support the U.S.-led resolution, and will enjoy the benefits, even though it’s still sanctioned by the Leahy Law that bans military assistance for those countries that violate human rights with impunity. Other beneficiary countries are Barbados and Grenada. Citizens of these countries may qualify for the interview waiver if they’re applying within 12 months of the expiration date and for the same visa category. Applicants must send their passports to the embassy in Barbados or visit in person. Venezuela has aided Antigua and Barbuda in multiple times of need. Late President Hugo Chavez lent US$50 million, rescuing the government of the two-island nation in 2009. Years later, the Bolivarian government forgave a debt of US$250 million owed through Venezuela’s state-owned oil company.